Whether you're moving out of state or across the country, the professional movers at Charles E. Groff have the knowledge and experience to coordinate every last detail or your move. At Charles E. Groff, we understand that moving is stressful for most people, especially when you're planning a long distance move. Long distance moves require different skills than local moves and demand a special set of skills, licenses and experience. Our years of experience as an authorized interstate agent for American Red Ball have taught us how to achieve hassle-free, on-time moves time after time! The first step is a free consultation by our experienced staff to put together a complete written estimate for our services. First we'll visit your home or office to review the items that will be included in your move. We'll provide a complete, written estimate for our services. Next, we'll schedule your move and send an experienced moving team to your home or office to load your packed items and furniture on our trucks. Your items will be weighed at a government regulated weigh station to determine the final weight of your shipment. The same crew that loads your items will accompany your items to their destination and unload them at your new location. This continuity ensures critical details aren't missed. 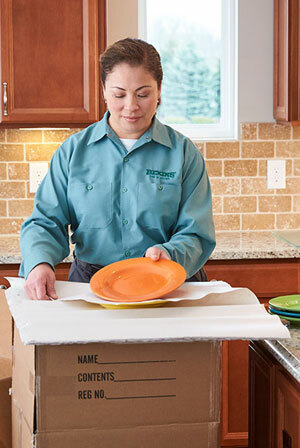 Our professional moving crew will reassemble any items that were disassembled during the move and place them in the location of your choice at your new home or office. Our moving services for long distance moves are competitively priced based on the weight of your shipment. We will determine your total shipping weight on the day of your move. All of our moving crews are experienced, full-time employees, many with over 10 years of moving experience. We never use temporary labor. The same crew that loads your items will unload them at your new destination to ensure a smooth and successful move. We are an authorized interstate agent for American Red Ball and are fully licensed and insured to handle your interstate move. Contact us today to plan your long distance or interstate move! Check out our packing services and let us take one more thing off your to do list! Need to store some items during your move? Charles E. Groff offers a variety of storage options to suit your needs!